Handcrafted ceramic yarn knitting bowl for holding your yarn while you knit. 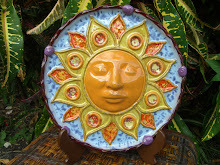 I made this on my pottery wheel and then decorated it with a beautiful medallion from my handcrafted sprig collection. 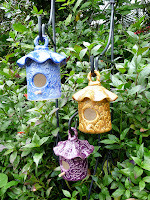 More styles and colors can be found in my Etsy Shop. 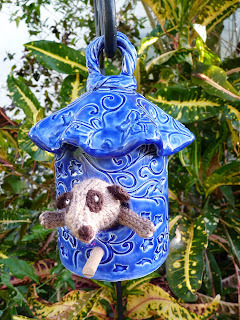 Garden Birdhouse- Please click here to see it in My Mother's Garden Etsy Shop. 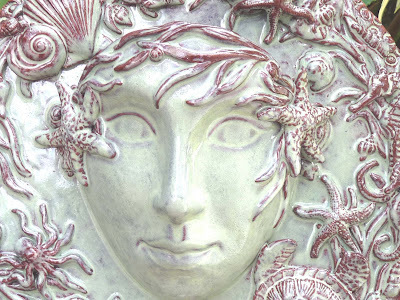 The Spring Garden Goddess Collection. Today my heart longs to be nestled amongst the trees. 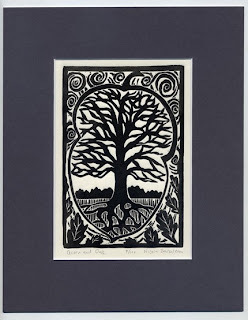 This collection of tree inspired art was created from the many varied artists found on Etsy. I hope you enjoy looking at all of these beautiful treasures. 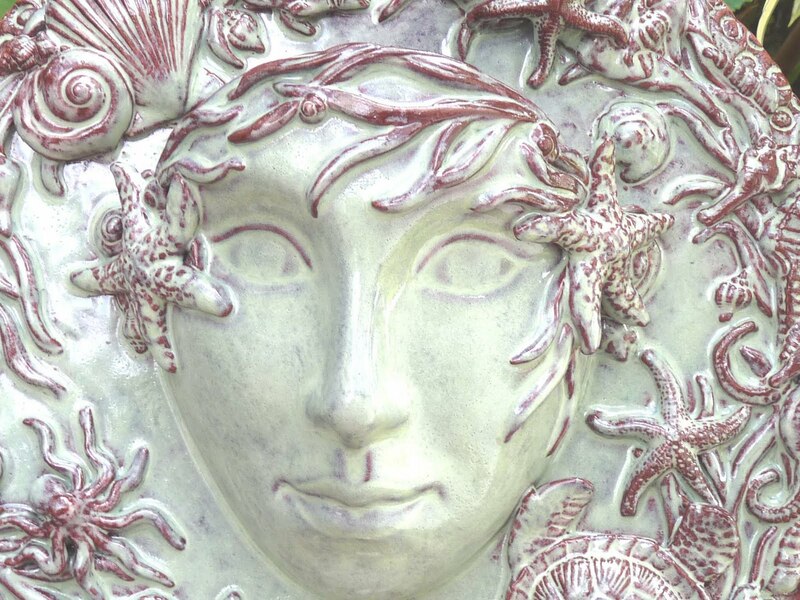 Today's interview will be with Nicola Barsaleau of Blue Cicada and Nicolasartroom. 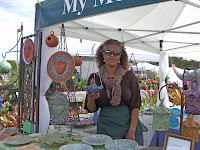 What is your art, hobby or craft? How did you come to creating it? 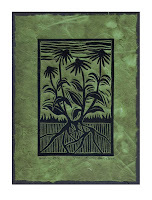 I create linocuts. These are carved blocks, rolled with ink and then printed by hand. 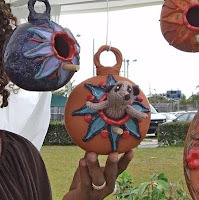 I first came in contact with this art form in South Africa, where I grew up. 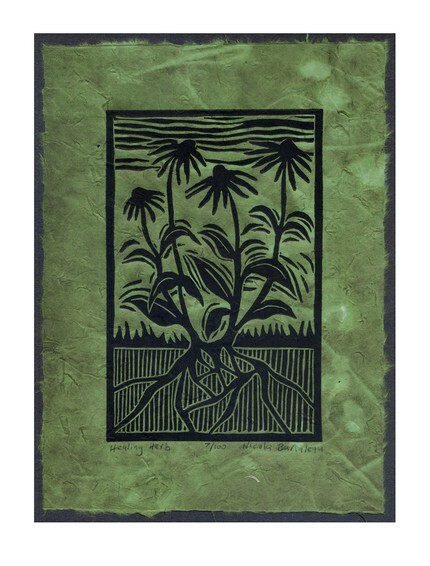 Linocuts are a perfect medium for a strong social message. 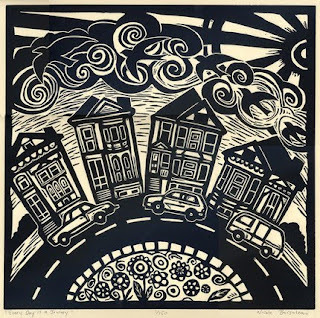 And the bold imagery of a linocut goes well with activism. When I lived in London, I learnt to make my own and I’ve been making them ever since. My inspiration is a sense we are all connected spiritually. We all have an inner life and we all have inner strength in goodness. Sometimes this strength appears covered, like when we go through a period of depression. Yet I believe we are capable of amazing things when we align with our true nature. 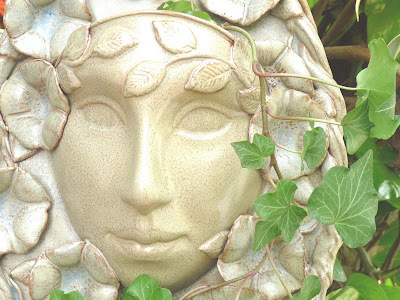 How does your garden or nature influence your art? 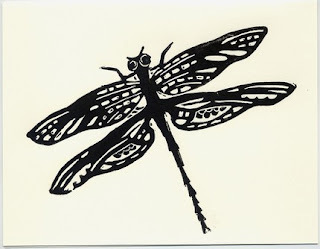 Nature inspires me with a sense of mystery, a sense that there is something far greater (and smaller!) than I can possibly perceive. After spending time outdoors, I always come away with the seed of wholeness, which, in turn, inspires me to make art. My experience is that making art is very much a process of wholeness and flow. Will you share a picture of your garden with us? Of course! Here is a picture of our vegetable garden. 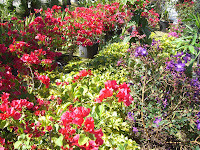 In Florida, everything grows very quickly during growing season! 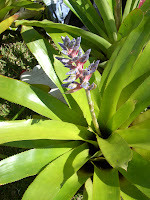 Will you share a few pictures of your favorite plants? Yes, bamboo! 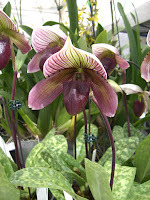 It is hard to stop my heart soaring when I step back and view these strong, beautiful plants. 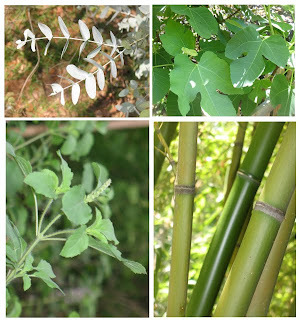 Of course, their strength is not only in their rods—if you ever plant runner bamboo, be sure to dig a lined trench a few feet deep to create an underground barrier! Others featured here include the fig and the eucalyptus tree. Do you have a favorite public garden to recommend? 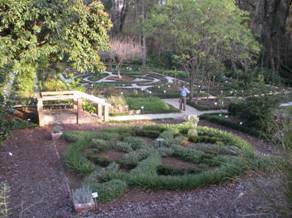 Yes--the herb garden and the bamboo garden at Kanapaha Botanical Gardens in Gainesville, FL. Also, I have strong recent memories of Fort Matanzas State Park in St. Augustine, Fl. 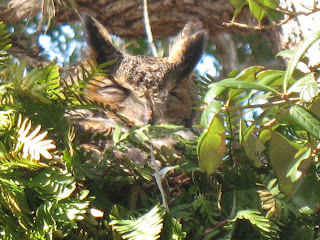 A few months ago, a couple of great horned owls nested in the tree directly behind the visitors’ center. So we got to watch the baby owl grow up and move from tree to tree before it flew off! The picture here shows the mother owl trying to rest while sitting on her egg. 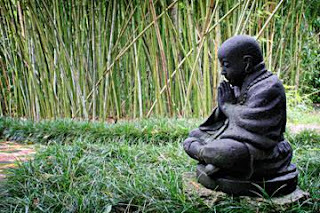 What is the best lesson you have learnt from the garden or nature? Nature teaches me listen. When I am fortunate enough to carry this through to my daily life, I listen before I act. 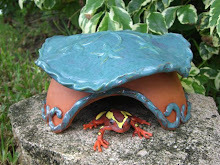 Show us your favorite item in your Blue Cicada Etsy shop. 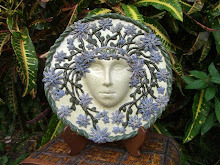 Share a favorite garden or nature related item from a fellow Etsy shop. Nicola, I thank you for sharing the joy and inspiration found in your art, nature and gardening. I am proud to share with everyone that one of Nicola's beautiful linocuts was recently given to me as a gift by my dearest childhood friend. 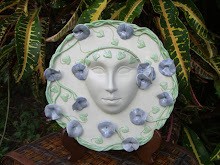 I have it placed on the wall in my ceramic studio and get to look at it everyday. It is even more special to me now that I know a little bit about Nicola, the artist who created it. 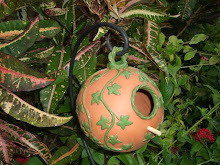 Alchemy is in the Garden! 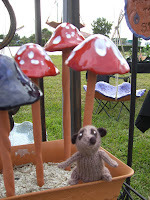 Alchemy, the traveling meerkat, arrived from the home of Niftyknits of Somuchyarnsolittletime in Tenterden, England early this week. Alchemy begins her world tour here in Coconut Creek, Fl. at My Mother's Garden. I was surprised and delighted to see her little head poking out of one of the birdhouses hanging in the garden. We spent part of the first day in the garden looking at all of the blooming flowers. Her favorite blooms seem to be the nasturtium. Of course...I believe this is because they are edible and delicious and she just couldn't get enough of them! You should try them someday. They look lovely on a bed of mixed greens and add a little zip to the flavor of your salad. 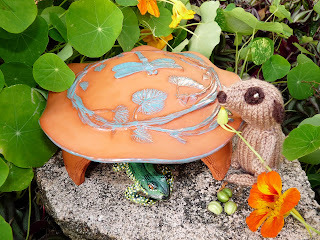 I've promised to give her some seeds to take to her next world tour stop at Pamela's, the basket and fiber weaver at Bazketmakr in North Carolina. 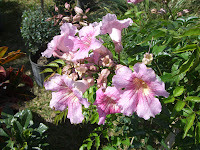 Pamela has an amazing variety of azaleas growing in her garden. 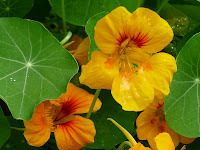 Check out this recipe on Youtube for Nasturtium salad. Alchemy decided to spend her second night lounging about in one of the toad abodes that just happens to be situated right in the middle of a nasturtium patch. Hmm...I wonder if she had an ulterior motive for wanting to sleep in that area of the garden. Do you think it was the yummy nasturtiums? 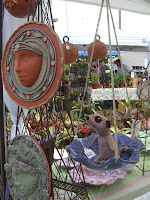 On day three she accompanied me to the GardenFest, a festival celebrating everything garden related, where she spent the day greeting customers while perched inside the assorted birdhouses, mushrooms and bird feeders for sale in my booth. 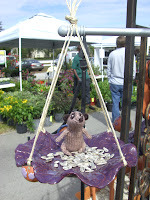 To our surprise, one of my customers had heard about the traveling meerkats from a friend and was just tickled to see one in person. 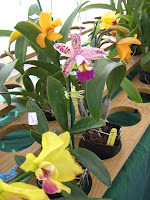 These are a few of the garden related sights at the GardenFest festival. 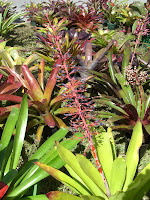 A dazzling array of bromeliads. 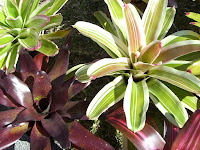 And more tropical plant varieties. 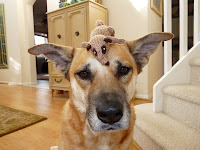 Our last day together was spent relaxing around the house with a little time set aside for her to get to know our dog Cici. If I can so say myself, they looked so cute hanging out together. 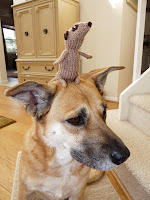 I had to continually convince Cici that this little meerkat was not a new chew toy for her to chomp on. In the end they made for perfect friends. 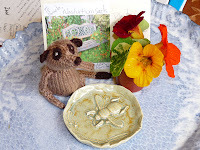 The final picture is of little Alchemy with her nasturtium seeds and Honey Bee in the Garden trinket dish for the final giveaway. 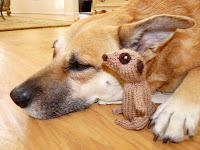 If you're interested in seeing where the other meerkats have traveled to, go check out the Niftyknits Meerkat World Tour page here. 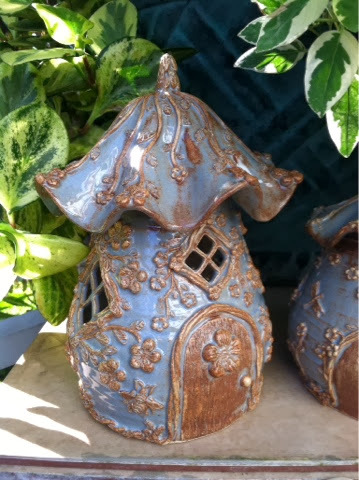 My Mother's Garden online shop has a variety of newly created birdhouses and toad abodes for spring. Stop by and visit if you'd like!